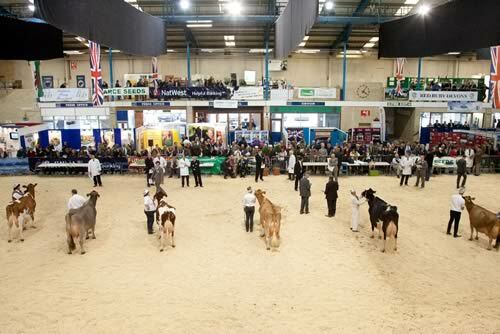 The English Guernsey Cattle Society National Show is coming to the Dairy Show in 2015. It is thought that the Guernsey breed originated from cows from Normandy that were brought to the small group of islands in the English Channel now known as The Channel Islands, but there is no precise history. During the 20th century some of these cows were brought to the Mainland, the nucleus of the population, then and now, being concentrated in the South West. However there are isolated herds, some large, throughout the UK, and Guernsey cows are also found in most of the Commonwealth countries, particularly Australia, New Zealand and Canada. There is also a significant population in the USA. The cows are renowned for their even temperament and longevity. Their milk is much prized in production because of its high levels of Butterfat and Protein and its rich, golden colour created by naturally occurring carotene. In recent years it has also been found to contain high levels of A2 Beta Casein, which although not medically proven, is thought to be beneficial to health. Guernsey milk also contains naturally occurring high levels of Omega 3.